Tucked away inside of the state of Tennessee are 56 state parks. Every area has its own unique charm and well-known features, but each park also has secrets tucked away. From the west end of the state that borders the Mississippi River to the east end that lies along the Appalachian Mountains, you'll find endless possibilities for adventures year round. We have put together a list of gems to get you started. However, the best part of a treasure hunt is the excitement that lies within the pursuit of finding all that is hidden. Check out the list, find your adventure, and then share it with us! Great Falls in Rock Island State Park. Kristi Parsons. Rock Island State Park in Middle Tennessee, is filled with beauty and waterfalls. Stepping into the gorge to explore Great Falls is like finding a hidden doorway to a tropical island. However, it's also one of the most popular areas of the park. If you're looking to explore a lesser known area of the oasis that awaits, you'll want to explore The Blue Hole. From unique geological features to glow worms, you'll find plenty of notable discoveries in Tennessee's Pickett State Park. There is one characteristic that makes it stand out among other state parks, though. In 2015, the International Dark-Sky Association added the park to its list of official Dark Sky Parks. The area has a minimal amount of light pollution and therefore is a must-see spot during a new moon. Wanting to add a night under the Milky Way to your bucket list? Pickett State Park is the place to check it off! For a very unique experience while exploring Tennessee's State Park, check out Frozen Head State Park. You'll find plenty of waterfalls, trails to hike, views from the fire tower and more. You'll also find one of the most infamous ultramarathon trail races in the country. The park is home to the Barkley Marathons, 100 miles in 60 hours. The run is based on the 1977 escape of James Earl Ray from the nearby Brush Mountain State Penitentiary. The assassin of Martin Luther King Jr. only made it 8 miles during his 55 hours of time in the woods. If you can still walk after your 100, swing by the prison when you leave the park. Oh, and if you don't finish the marathon, don't let it get you down. Only 15 runners have finished the race since 1989. I know you're thinking that a Tennessee trail run can't be that hard, but the Barkley's total elevation change is equal to climbing and descending Mount Everest twice. Good luck! Stinging Fork Falls. Kristi Parsons. The Justin P. Wilson Cumberland Trail State Scenic Trail State Park is one long name for a park and one long park in Tennessee. Winding its way through 11 counties, the park currently has 40 trailheads open for use, with more to come. With all of that space covered, it's easy to see how this is one park with many gems. From Black Mountain to Ozone Falls to a section of the Laurel-Snow State Natural Area and Stinging Fork Falls, this is one area of the state that you'll want to explore time and time again. South Cumberland State Park is spread throughout four counties in Tennessee. You'll find geological features sure as the Great Stone Door, the Sewanee Natural Bridge that is an amazing sandstone arch, stunning gorges, and one of the largest cave openings in the state. 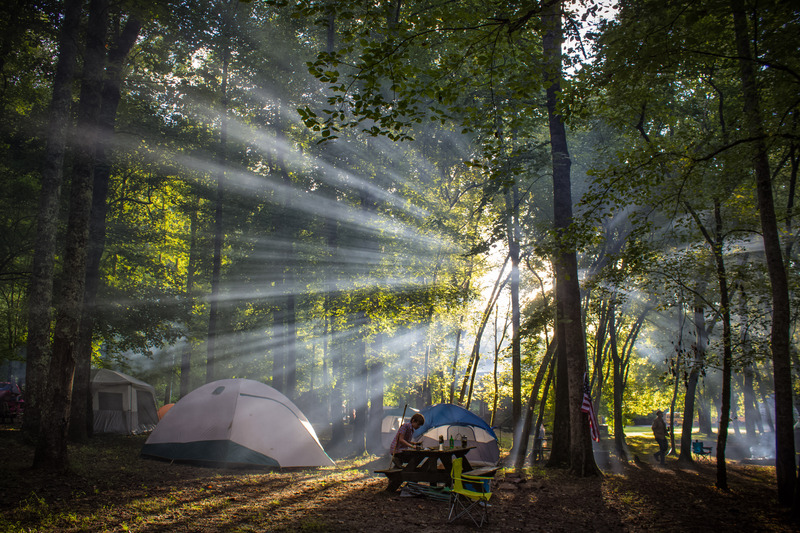 Some of the best backcountry camping in the state can be found within the park's boundaries. 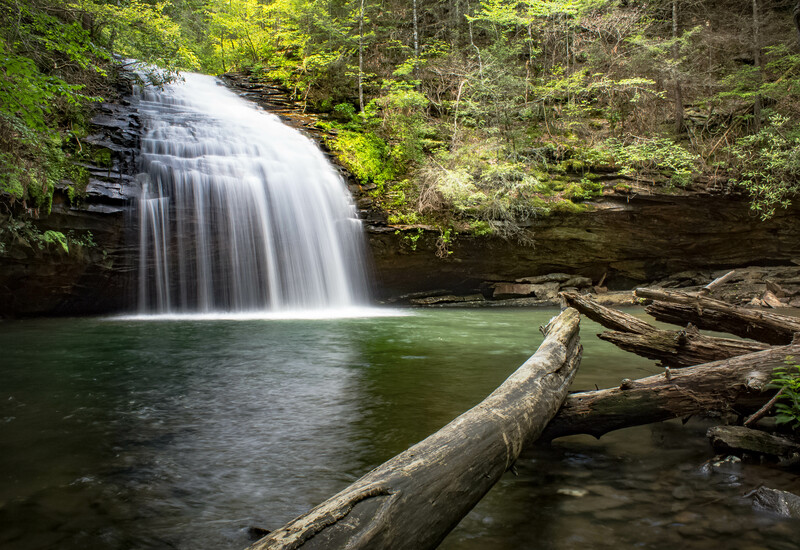 The Fiery Gizzard Trail was once explored by Daniel Boone and is now a top rock climbing destination. You'll also find the stunning Foster Falls along the trail. The numerous waterfalls and cascades that fill the park are just a bonus to an already spectacular area that's filled with a wide range of adventures. Camping in Hiwassee on a stunning afternoon in the forest. Kristi Parsons. To say that the Hiwassee/Ocoee Scenic River State Park itself is hidden would be far from the truth. Mostly due to the fact that the park is home to internationally-recognized whitewater fun. You'll find Class I to V rapids, including a run that was used during the 1996 Olympic Games whitewater competition. The raging river is also a hot spot for those seeking to cool off in the summer months. Find the same adrenaline rush at plenty of gems away from the river. Check out the Gee Campground and soak up the tranquility along Gee Creek while flyfishing for rainbow trout and other fish. The area is filled with treasures and beauty year round. For more information and destinations, check out Tennessee State Parks. Choose your adventure and start exploring!